Reader Chandragupt sent us this picture from Bristol. 'I work in Bristol. 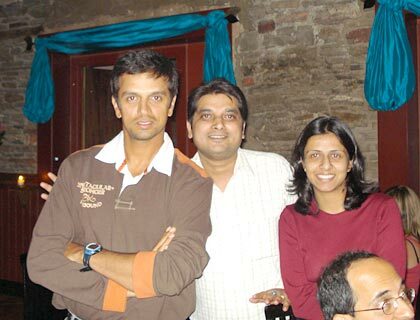 I met Rahul Dravid [Images] when the team was out for dinner at a local Indian restaurant in Bristol,' writes Chandragupt. Thanks Chandragupt for sharing the photograph! If you encounter your favourite cricket/sports personalities, please mail the photograph or video to sportsdesk@rediff.co.in. We will feature the best images or videos right here on Rediff Cricket or Rediff Sports.